In the last twenty years or so the music of the Russian composer Nikita Koshkin (b. 1956) has been recorded and performed by some of the most highly regarded guitarists in the world so it seems amazing that this disc marks his personal debut as a recording artist. With it he has undoubtedly established his unique voice in 20th Century guitar composition and beyond, but also as a master interpreter of his own music, which is not always the case with some composer/performers. From the onset Koshkin holds the attention, with solid articulation and bell-like harmonics in the opening piece, 'Prelude and Waltz, Homage to Segovia', a tribute to the maestro guitarist who was influential in Koshkin taking up the guitar at the age of fourteen. 'Guitar' was a commission in 1986 from George Clinton, the editor of Guitar International Magazine, and published therein that year. It is another tribute, this time to the guitar itself. The remaining four works are programmatic, something Koshkin excels in. 'Rain' a subject that composers from Chopin to Brouwer have used as a source of inspiration, finds Koshkin conveying through the guitar the force of nature within a rain storm, from the firm gentle drops to a soaking torrent, then subsiding again to mere droplets. It seems strange that emotions can be aroused by a piece of music based on clocks but this is just what Koshkin manages to achieve, to capture the mechanical flavour of his 'Piece with Clocks' (Tempo di Tick-Tock is indicated on the score). Koshkin uses an eleven string guitar which he describes as 'prepared' using cork, a foam mute and matchsticks to extend the effects that are already a feature of Koshkins music. Tambora, left hand slurs, pizzicato, string bends, various percussive techniques together with the full range of dynamics and sound colour available to the guitarist are all part of his formidable technique. Yet at no time are these devices used simply for novelty value or randomly. They all have their place always enhancing the musical structures. Inspired by Edgar Allen Poe's 'The Fall of the House of Usher' the 'Usher Waltz' is a well known work. John Williams recorded it on his Seville Concert CD (Sony SK53359) but in the composers hands it takes on a more sinister nature. The savagery of the playing intensifying the decline into madness. 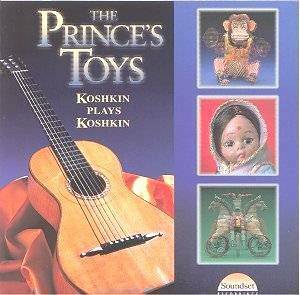 The title work of the CD, the 'Prince's Toys' written in 1980, had its first recording by Vladimir Mikulka in 1983 (BIS-CD-240); is a suite of pieces that illustrates in music the story of a prince who abuses his toys, which includes a mechanical monkey, a doll with blinking eyes and a group of soldiers. They eventually rebel and in their turn they mistreat him, until he tries to escape in his toy coach. They pursue him, eventually catching him and turn him into one of them, a toy, or do they? It is left to the listener to decide. The whole work is again punctuated with Koshkins splendid use of effects that provokes a sense of phantasmagoria. I thoroughly recommend this disc and I am sure it will take a pride of place on any classic guitar enthusiast's shelves.